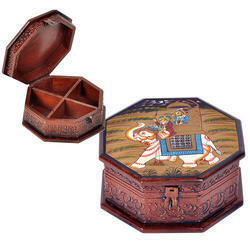 Size: 8.75" x 2.25" x 1.25"
Paper Mache Box is a delicate decorative art, which showcases the artistic zeal of a craftsman. We offer a huge range of paper mache boxes to our clients. - Special hand made printing designs.